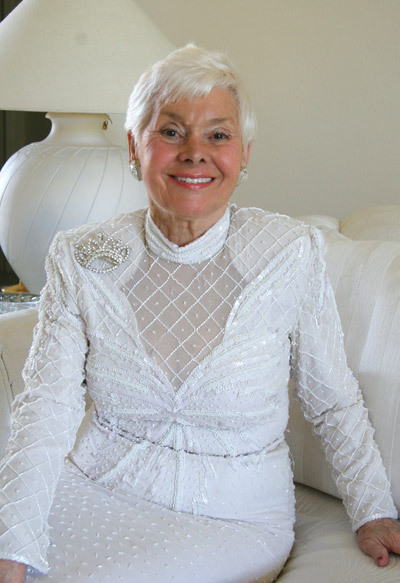 Louise Ferla relaxes in a beaded gown at her home in Valencia Lakes. Lisa Stark photos. From singing Christmas carols for military servicemen to baking cookies to send overseas to the troops, Valencia Lakes resident Louise Ferla has always kept one thing closest to her heart: giving back to Americans who have served our country. Ferla’s voice slightly quavers with emotion when she describes some of the experiences she’s had with active-duty and retired veterans alike during her 40-plus years of volunteering. During those years, Ferla learned a great deal about the entertainment industry, as well as societal attitudes and prejudices of the time. As time went on, Ferla evolved into a seasoned entertainer, singing in casinos, nightclubs and lavish private parties. 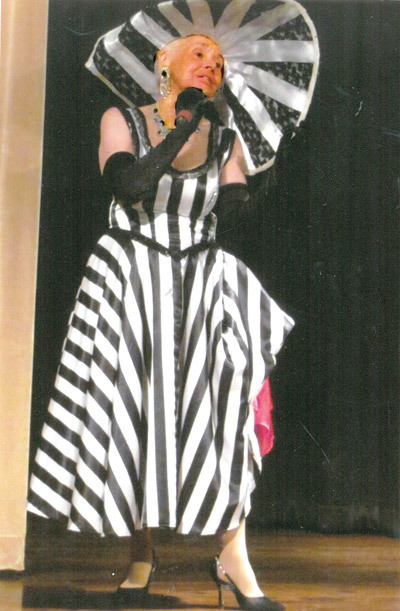 She developed her vocal identity, along with her trademark style in costuming. It was her innate fondness for glamour and elegance that led Louise into her next passion: the world of American beauty pageants. When Ferla became active in the Ms. Senior America Pageant more than ten years ago, she would take contestants along with her on her travels, visiting veterans’ hospitals and nursing homes, entertaining the men and women who had served their country. She often covered her expenses using her own money or organizing benefits to raise funds. Her eyes became misty when she recalled a letter she received from an Army sergeant in Afghanistan, asking if she might have an old guitar she could donate to his troops. Louise Ferla recently helped produce and performed at the Valencia Lakes Variety Show held on April 18th. Through the pageant, she said, she has made lifelong friendships with women from all over the United States. Her face clouded slightly when asked about how some people view beauty pageants as shallow or self-serving. Today, a refined sense of style and grace is clearly visible in Ferla’s Valencia Lakes home. “I’ve always enjoyed classic furniture and beautiful artworks, things that bring a smile to my face” she said, gesturing toward her collection of porcelain dolls and a framed modern art painting signed by David Letterman on her dining room wall. She spoke fondly of the interesting places and people she has encountered along her journey. The recipient of a number of awards recognizing her achievements, her favorite honor was being asked to perform at the White House in a 2000 Christmas Holiday Showcase. This year, the 2015 Ms. Senior America Pageant will be held at the Resorts Casino Hotel in Atlantic City, N.J. For more information, visit www.senioramerica.org or call 732-746-2598.